We sharpen most tools and saw blades that are used in conjunction with the woodworking trade. We also supply new saw blades, planer knives, router cutters, band saw blades, mortise chisels, turn over blades etc at very competitive prices. We manufacture spindle moulder and planer/moulder cutters and we will make cutters to match your profile. We offer a fast turnaround at a very competitive price with a service that is second to none. 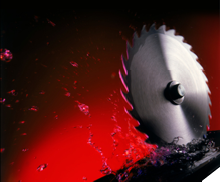 Our professional range of saw blades and new tooling is top quality, try it, you will not be disappointed. Our range of site blades for chop and skill saws is excellent value for money.